Up and coming events as well as details about past events. Disco-Raffle-Comedian-bring your own drink/alcohol !! Pauline and her friends regularly fund raise money to help local causes and this September they will be hosting an event at Gateway, aiming to raise money for Eye Gaze Technology & Assistive Technology where service users will be able to experience and benefit from this wonderful communication aid for people with profound disabilities. The equipment will help with stimulation of the mind, education and enjoyment of interactive technology. Please show your support for this event by purchasing a ticket and coming along to what is going to be a fantastic social event. Tickets can be purchased by contacting Pauline Duffy. We would be very grateful to any organisation who will be generous enough to donate any prizes for our raffle. 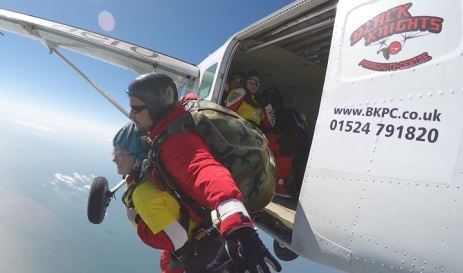 Sky dive event to raise funds to get an EyeGaze communications device. Please contact Gateway for the time and location of the event. Because of unfavourable weather this has been rescheduled for th 23rd September. Please see the full event details by selecting THIS LINK. With the local and general elections taking place on 7th May 2015, we organised an open session on the 31st March 2015 (for Rochdale service users, families and carers) with this year’s election candidates to get their response on issues important to you! For the full leaflet for that event please select this link. A fabulous Red Nose fun day at the Gateway Centre. Please select this link for further details about this event as well as photos from the event.